In a Facebook post, the group said Bissonnette was “unfortunately known by several militants in Québec City for his viewpoints that were pro-LePen and anti-feminist, as expressed in social media and at the Université Laval”. Another classmate, Jean-Michel Allard Prus, described Bissonnette as someone with “right-wing political ideas, pro-Israel, anti-immigration. I had many debates with him about Trump,” he said. “He was obviously pro-Trump.” But Bissonnette had never broached the idea of violence as a political tool, he added. The charges came hours after the attack at the Québec City Islamic cultural center, also known as the Grande Mosquée de Québec, during evening prayers. Six people were killed and another 19 injured. Five people remain in critical condition in hospital. Police initially said two men had been arrested after the attack. But later in the day, provincial police clarified that only one was a suspect and they had released the other – considered to be a witness – without charges. On Monday, the names and identities of the six people killed in the attack began to emerge. All of them were fathers. Azzedine Soufiane, 57, a grocer and father of three, was well-known in the community and beloved for the time he spent helping newcomers adjust to the city. Also among those killed was Abdelkrim Hassane, 41, an information technology worker for the government and father of three, as well as Aboubaker Thabti, 44, a Tunisian-born father of two. Mamadou Tanou Barry, 42, and Ibrahima Barry, 39, close friends who had emigrated from Guinea to Canada, were also killed, leaving behind four and two children respectively. The attack shocked many in this quiet city, home to just over 500,000 people. Violence is rare here – in 2015, the city reported just two murders. 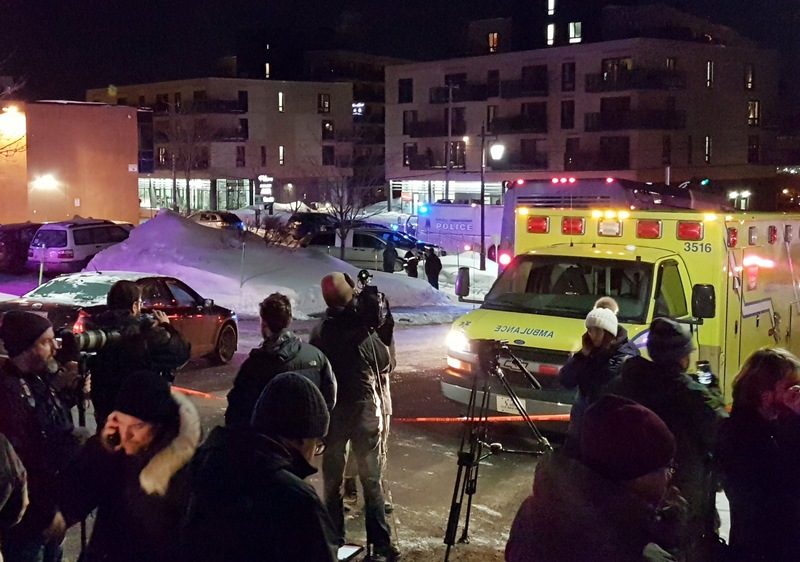 Phillippe Couillard, the premier of Québec, described Sunday’s shooting as a “murderous act directed at a specific community” and also expressed his solidarity with Muslims in Québec. “Québec categorically rejects this barbaric violence.” Security had been increased at mosques across the province, he added. Vigils were planned across the country, while people around the world used social media to express their condolences and voice their support for the mosque. A Go fund me page, set up to help the families of the victims with funeral costs, had raised more than C$120,000 by Monday evening.